The famous Baker Buildings of Jagersfontein. 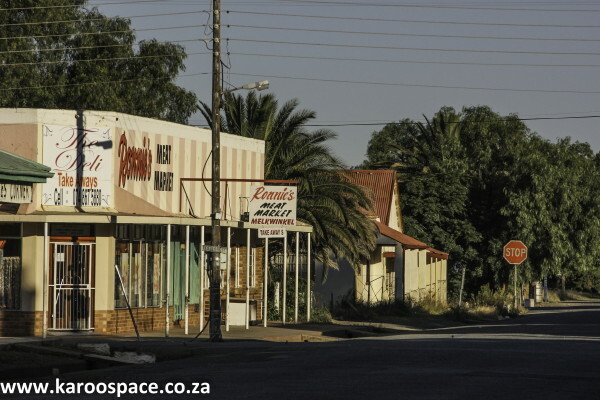 Jagersfontein is a dorp with its formerly bright lights dimmed, but not forgotten. It used to be a diamond boomtown until De Beers abruptly announced they were pulling out in 1971. By the end of 1973 they were gone. Driving through today, you see little left of the wealth that was once extracted here. You’ll find three Chinese shops (“Lay-buys” offered), a Pep Store and a Standard Bank, three butcheries and a set of burnt-out municipal buildings. The latter being, obviously, a testament to service delivery protests. A magical moment on Meteor Street. The Jagersfontein magic is still there, however. You just need two conditions for it to become clear: early morning light and a certain angle on Meteor Street. Then you will see a block of Herbert Baker-design buildings that have spare, harmonious lines. In the quiet pink of early morning beauty, these buildings relive the grace it must have had decades ago. Malik Munir, the town’s one and only Pakistani trader. By 8.30 am, the light is charm-free once again and the buildings revert back to Small Town Main Street: a Standard Bank and a Pep Stores and Malik Cell Phone Shop and Ekasi Kitchen. With people milling about under its rather striking wrought iron pillars. 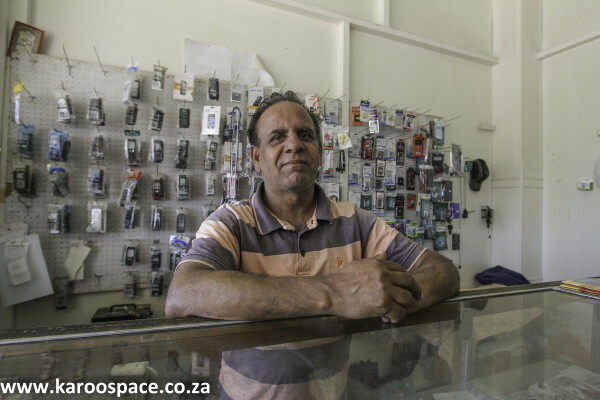 In Malik Cell Phone Shop Malik Munir, who lived in Jagersfontein for a year, says life is all right here. He shrugs. He is the only Pakistani in Jagersfontein, sending most of his earnings back to his family in the home country. “Jagersfontein is a good place” says Malik. “At least it’s quiet, not like Johannesburg. Taking refuge in a shop on the main street of Jagersfontein. We duck into a grocery shop to hide away from a crazy old woman in the street (she demanded sole copyright and world re-sell rights to every photo we took in town) and find a young Chinese man sitting behind the cash till. He looks like the most bored somebody in Jagersfontein today. “What’s your name?” we asked. 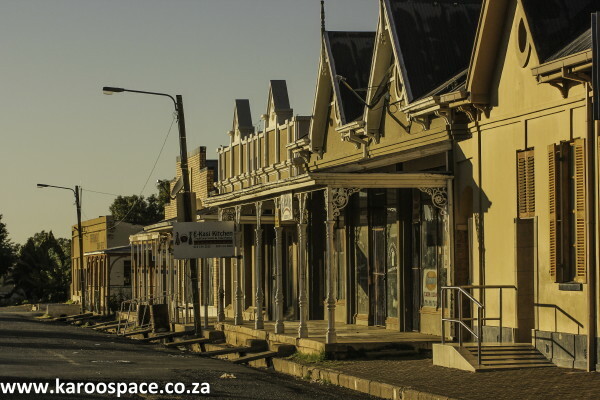 Other shops around the square and along the main street include the Jagersfontein Mark en Gesondheidswinkel, Shane electrical, Hendrikz Begrafnis Ondernemers, Jagersfontein Trading Post (“Oop vir Koop, Verkopers en Pand.”). The old bank building is now a kind of night club (Spotlite Pub and Grill) and throbs with loud music in the late afternoons. There is also Lektronic Furniture, A2 Cell Sound Repair Cellphone SameTime. Gil Vermaak, who has special memories of old-time Jagersfontein. Gillian Vermaak, an old friend and long-time local Jagersfonteiner, remembers what this town used to be like. She tells us one of the stores in the “Baker Block” was called Van der Merwe & Joubert. 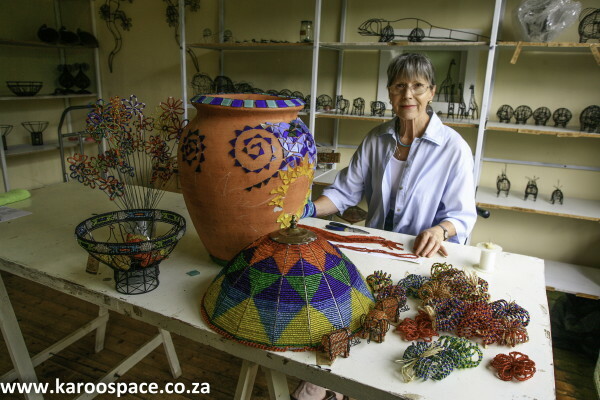 It was run by a tremendously fat lady called Tannie Mara van der Merwe. She sat on her chair all day long. Any enquiries for what the shop sold (everything from groceries to bicycles and hairpins) was met with a wave at the contents. “Have a look for yourself” she would say. Where Pep Stores is now, is where there was Rabie General Dealers. Here you could find pots, pans, crockery, blankets, household goods. 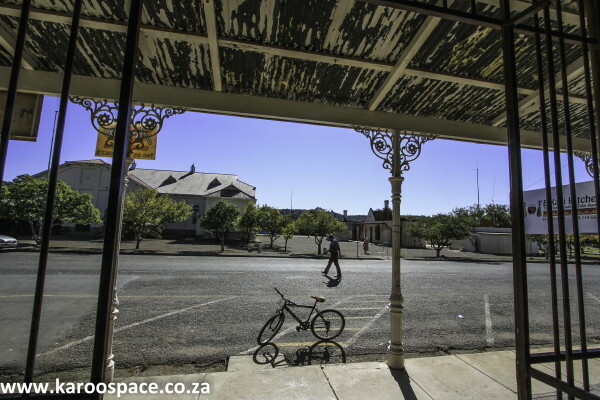 Old man Rabie would sit in the window of his shop so he could be warmed by the sun in winter. The kids would crawl past his counter into the back, steal some sweets and crawl back.